Genoa was once a maritime powerhouse, ruler of the Mediterranean during the 12th and 13th Centuries and birthplace of Christopher Columbus. It's still a great port, but great ports are places of busy industry, so Genoa isn't one of the most elegant of Italian cities. Some of the best places to stay in Genoa are also some of the most reasonable places to stay on the Italian Riviera. What Genoa is is a vibrant, living place, ageing with style, with a gritty ancient maze of narrow streets at its heart, a reputation for excellent cuisine and some very well done regeneration work - including one of Europe's largest aquariums. Genoa also makes an excellent base for exploring the whole region, including jewels like Portofino and the Cinque Terre. Genoa's historic centre is one of the largest old towns in Europe, a sprawling maze made up of the caruggi, tiny streets and alleys which run all the way down to the old port. Behind these alleyways are the facades of grand old palaces and Mediterranean style houses with their red roofs. There are plenty of charming squares, overflowing with seating from cafes and bars, and tucked away in some of the quirky little alleys you'll find boutiques, galleries and restaurants. Don't be too worried about getting around. Yes, this city has some steep sections, but it also has its own municipal lifts to help you get from one pitched street to another. You'll also find the house where Christopher Columbus was born, the Lanterna, Europe's oldest lighthouse, and a number of palazzos, churches, piazzas, museums and art galleries. In 2004, Genoa was the European Capital of Culture, and this cultural and financial boost helped to polish up some of the existing attractions, and inject some new ones. This is when the aquarium and maritime museum were built and the port regeneration took place. Genoa also has several of those impressive, striped Ligurian churches, including the Cattedrale di San Lorenzo, which was built to house the relics of John the Baptist. Be sure to visit the old seamen's neighbourhood of Boccadasse, a wonderfully picturesque bay with colourful houses on the waterfront. Located on the outskirts of Genoa, there's also a lovely beach. The incredibly ornate Museo di Palazzo Reale exudes opulence with a gilded hall of mirrors, a huge grand staircase and a courtyard featuring a fountain. A 16th-century royal palace from Genoa's Golden Age, this is a breathtaking visit! Tickets to wander around cost €6 for adults and are free for under 18's. Go on the first Sunday of the month and it's free for everyone! The Galleria Nazionale di Palazzo Spinola, another historic mansion, features stunning interiors - including a top floor gallery boasting paintings by Van Dyck and Rubens. Tours (with English speaking guides) set off every half an hour and bring to life the place's history. Head along the Passeggiata Anita Garibaldi a Nervi, a 2km long pathway hugging the rugged coast and boasting wonderful seaviews. With a number of restaurants dotted around, you can really make a day of it. Walk up the lovely Via di Porta Soprana to see the Torri di Porta Soprana, one of the 5 original gates to the city. Built in the second half of the 12th century, this historic spot is well worth a quick visit. The Italian Riviera is backed by mountains, giving it a microclimate protected from the northerly winds, so it's quite pleasant from late winter/early spring. If you're visiting over the summer, though, be sure to plan ahead if you want to grab a room in one of the best places to stay in Genoa, they sell out fast! 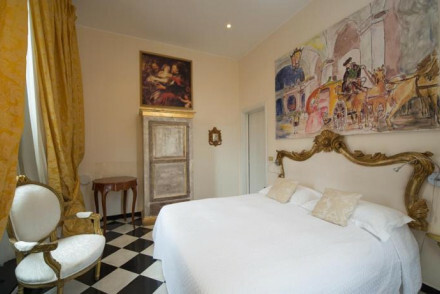 The Hotel Le Nuvole is a beautiful, traditional townhouse in central Genoa not far from the beach. The architecture is a Renaissance wonder, while the rooms are sleek and contemporary. A wonderful mix of worlds close to many of Genoa's highlights. Porto Antico B&B is a chic stay located in Genoa's city centre. Set in an historic building, the whitewashed rooms are contemporary and minimalist in style. Perfect for exploring the area. San Giorio Rooms is the ultimate stylish city stay! This historic guesthouse, superbly located right by all the sights, boasts ornate rooms featuring plenty of artwork on the walls. Quarto Piano is a stylish B&B in the heart of the city, providing contemporary rooms with comfortable furnishings. Come back after a long day sightseeing and relax in the rooftop terrace hot tub! Locanda Di Palazzo Cicala is a truly unique stay in a glorious 18th-century building. Inside, you'll find rooms blending contemporary furnishings with traditional features. What's more, there are apartments available for families with full kitchens and living areas. San Giorgio Rooms boasts family suites in a wonderful location (if you don't mind spoiling the kids!). The whole family will love being so close to all the city's top spots. Along the same lines, the centrally situated Hotel Le Nuvole offers sleek family rooms not far from Genoa's beach and the tourist attractions. If you think you'd be best served by a self-catering option then check out the wide range available at our online partner, booking.com. The city's weather is nicest over the summer months, with the average temperature in July and August around 25°C and the sea being around the same temperature. Visitors should fly into Genova Airport, 7km outside the city, which is served by all major airlines. There are direct flights from London, however if you're coming from Edinburgh then you'll have a stopover in London, Amsterdam or Paris. Whilst there's no train service, if you're going from the airport to the centre of town then there are Rapid Bus services (taking 30-40 minutes) bringing passengers to the Principe and Brignole train stations. Alternatively you can take one of the many taxis lined up outside the terminal, though be prepared to pay significantly more. Browse through our list of all the best places to stay in Genoa. Expand your search to include all of the best places to stay in the region of Liguria. A delightful, historic guesthouse in the heart of Genoa. Its ornately decorated rooms embody the rich artistic culture associated with the city. The bespoke family suites provide families with the perfect opportunity to come and explore the historic mercantile city. An excellent value option. Local exploring - Perfectly placed for exploring the rabbit warren streets of the historic old town, right by the Porto Antico. Local markets - Explore the markets of Genoa's historic old town, filled with local crafts and produce. Sights nearby - Two minutes walk from Genoa aquarium and Genoa Cathedral. 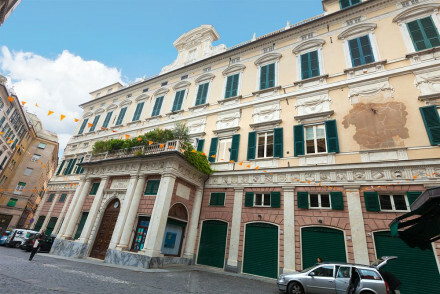 A beautiful traditional townhouse in central Genoa and not far from the beach. Wonderful Renaissance architecture. Contemporary sleek rooms, suites and family suites, some with mezzanine levels. 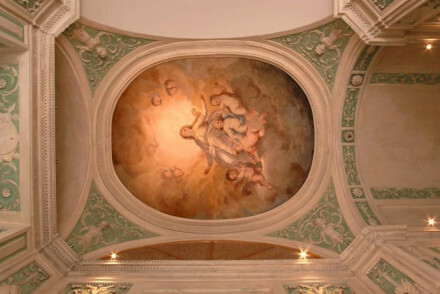 Murals and frescoes on the ceilings as well as marble floors. City style with the old and new. Sights nearby - Throughout the city you'll find marble Renaissance portals and niches with statues Virgin or of ancient columns. Traditional - Beautiful and traditional architecture. Unique hotel in city centre. Behind the 18th century facade, large rooms are blend of contemporary and traditional, with big bathrooms and French windows. Apartments have full kitchens and living areas. Sensational decor, central location and chic atmosphere. Very family friendly. 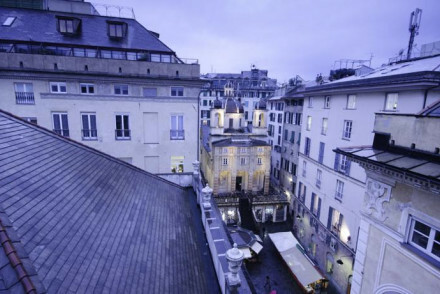 Chic B&B on the top floor of a historic building in Genoa's city centre. Here the sleek, contemporary rooms are whitewashed and furnished with minimalist decor. With Genoa's charming UNESCO heritage old town on the doorstep, it's perfect for exploring the city's rich culinary and artistic culture. Local exploring - Perfect for exploring the historic centre of the city on foot, within walking distance of harbour and the main museums. City Style - A stark contrast between the sleek modern interiors and the historic setting in the heart of Genoa's Old Town. Local markets - Explore the local markets of Genoa's historic old town and pick up a bargains. Sights nearby - Genoa Cathedral and Piazza De Ferrari are both only two minutes walk away. A smart, stylish B&B right in the heart of Genoa. The rooms are simply appointed with elegant decor and comfortable furnishings. Spend the day exploring the Genoa's rich culture or just as easily relax in the hot tub on the roof terrace. Local exploring - A slick and comfortable hotel, perfect for exploring the mercantile city of Genoa. Fishing - Organise a fishing trip from one of the cities many harbours. Sights nearby - Located just five minutes from Genoa Cathedral.